World of Tanks Console - Maximum Damage contest! Not one of those tanks but great damage for tier 6 light. Ran out of rounds. 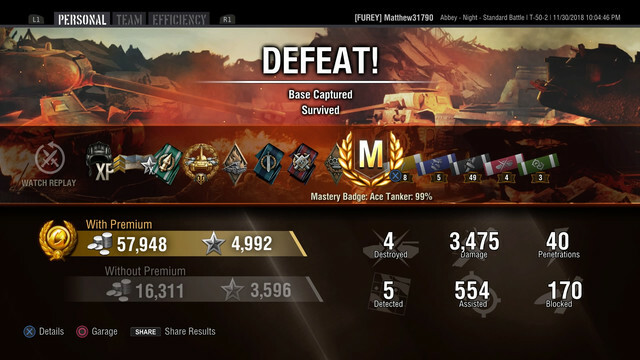 Beating the max damage score against all WOT players is a tall order, even if it's "only" for 2018. In all likelihood this effectively restricts contest to Super Unicom type players. FWIW - Wondering if using either the Mastery or Mark scores might work better. One option: If your best damage score beats the first mark average you get 1 point, beating 2nd mark average gets 3 points and beating 3 mark average gets 5 points. Each point equals an entry into a random draw. Would broaden the number of people that could win and rewards better play. Also means no reason for players not to post results during contest period. There were no Maximum damage takers for this round! We'll make another contest now that we are in 2019 and new records are being set! Game Community → English Speaking Community → Forum → Known issues and FAQ! → Immediate Support FAQ's → PS4 Controller recurrent wear issue; left thumb stick in full forward position does not result in max speed... anyone else?